Hail and snowfall is something which can cause huge damage to any car if same is parked outside without any protection. If timely removal of the hail stones is not done from the car surface then it will further melt and dry on the surface turning to be a reason of causing rust. Is there any way which can protect the car against hail when you are forced to park it outside? Well use of car cover can give you great relief about the worries you have regarding your car protection against hails. There are many companies which are into manufacturing of this product and we selected Top 3 among them to share with you. Well this is the primary choice of the car owners who wants nothing less than the best for their car protection keeping in mind its easiness of use. The car cover is big enough to fully cover the main body of most cars, from Mini, sedans to SUV, trucks and Pickup, etc.. Finest quality military fiberglass, metal, and durable cloth are done for crafting this unique piece of Lanmodo Pro winter car cover. It is powerful enough to protect the car against hails and comes with three windproof designs to withstand 30mph winds in winter. Strength suction cup secure it well on car top roof. Four windproof straps fixed on front mirrors and door handles to stable it. The 2-layer canopy makes winds flow through car cover to secure it and it won't be blown down easily. This car cover can work in weather condition starting from minus 20 degrees Celsius to 60 degrees Celsius. It is very easy to set up with the remote control and you need not worry about going out when there is cold outside. In 30 sec it can be installed and in 8 sec each it can be opened and closed. Can not used when you are driving. If there is heavy rain or heavy wind, don not use it. You can't close the automatic car cover if the battery runs out. Well this is a system to offer automobile hail protection which largely eliminates all chances of damages to your car or vehicle of any size from hail. This product is having of all needed features which you expect from a good quality traditional car protection cover and is also capable to keep hails away from your car. Use of breathable fabric is made and the cover is treated for UV (sun) and water resistance. Reflective silver finish of the cover also repels the infrared rays that can heat up the car interior. This system includes an early warning to give timely hail alert and hail forecast which support of mobile app for apple and android phones. Initial one-time system assembly will take approximately around 20 minutes after you receive the system for the very first time. The SUV2 system installation time is very high when compared to the Lanmodo and takes around 7 to 9 minutes time. The system starts protecting the vehicle upon use of remote controlled activation, and can stop hail of any size but takes around 7 to 10 minutes based on the level of the utilized power source. The system removal and repacking can be completed in 7 to 9 minutes time while Lanmodo takes just 8 sec only. Well this one is a 3 layer hail protection anti snow as well as anti ice car cover. To design this car protection system use of 3 layers which includes: outer waterproof nylon fabric, middle layer of cotton & last layer of soft waterproof polyester. Size customization can be done depending on car type as well as for look. Offers snow protection, hail protection in winter, UV protection and heat insulation in summer. 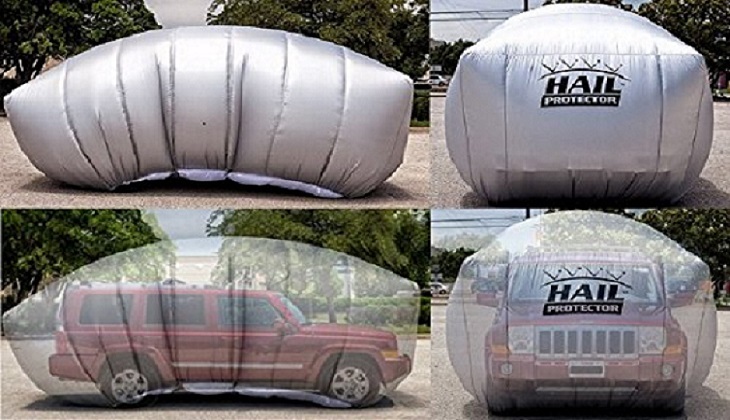 The hail car cover sizes need to be customized as per the car type and size. So if you have more than one car of different size you need to buy separately for each. After taking a note of the top 3 car cover for protection against hail damage we can see undoubtedly Lanmodo car cover is the best of the lot.